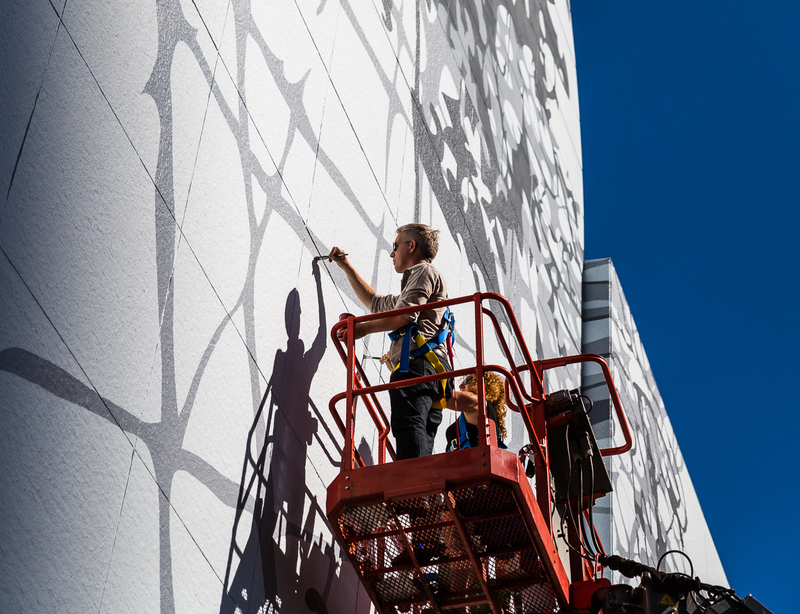 Artist Matthew Richie painted the finishing touches on Friday afternoon to complete the new 70 foot mural titled Remanence: Salt and Light (Part II) at Dewey Square on the Rose F. Kennedy Greenway. 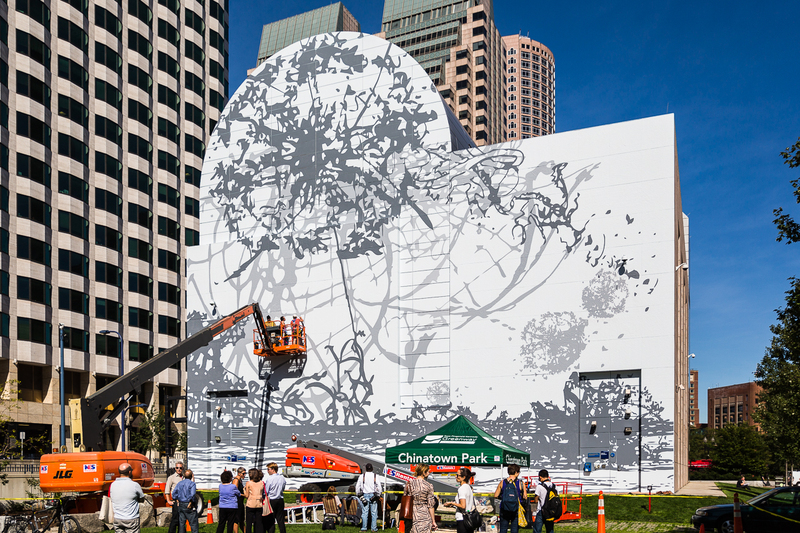 The mural program is a partnership between the Institute of Contemporary Art and the Rose Kennedy Greenway Conservancy. “I wanted to do something really different from the Oz Gemeos mural,” said artist Matthew Richie. The freshly painted white and gray abstract is the polar opposite of the brightly colored and controversial Os Gemeos “Giant” mural that appeared on the Big Dig tunnel vent building in 2012. 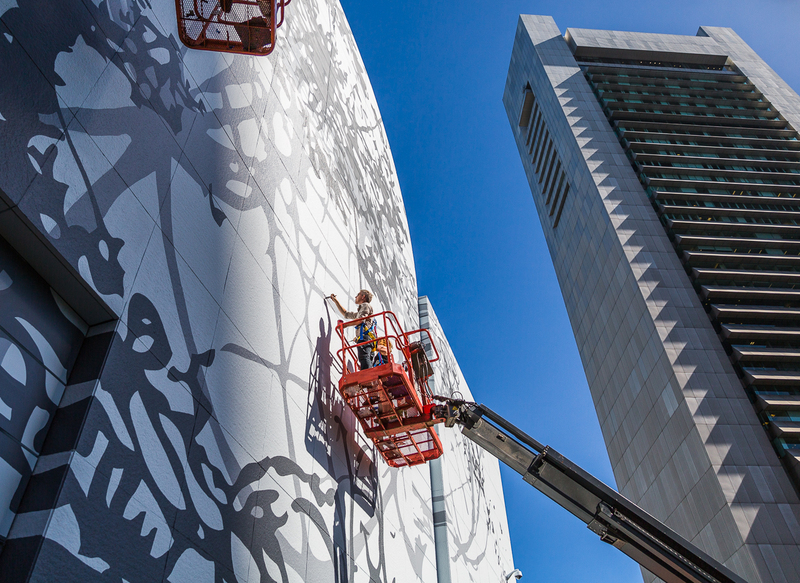 The mural at Dewey Square draws inspiration from Boston’s history and waterfront location and is expected to be displayed for up to 18 months. Intended to spur conversation, the abstract mural includes shaded clusters of exploding atom-like spheres amid elements resembling a shoreline, birds and planetoids. In a nod to the North End’s Paul Revere, Richie included an abstract figure depicting the famous colonial patriot on his horse (can you find it?). “Matthew Richie uses abstraction on a very grand scale to visualize information about systems of time, the creation of the universe, theories in physics and the history of art,” said Jill Medvedow, Ellen Matilda Poss Director of the ICA. “We’re thrilled to bring the evocative beauty and the dynamic history of abstract painting into daily public life in Boston.” The mural is part of Richie’s 18-month residency at the ICA that will bring art installations with sound, performance and video. The Greenway exhibit will also feature digital music by Bryce Dessner (The National). 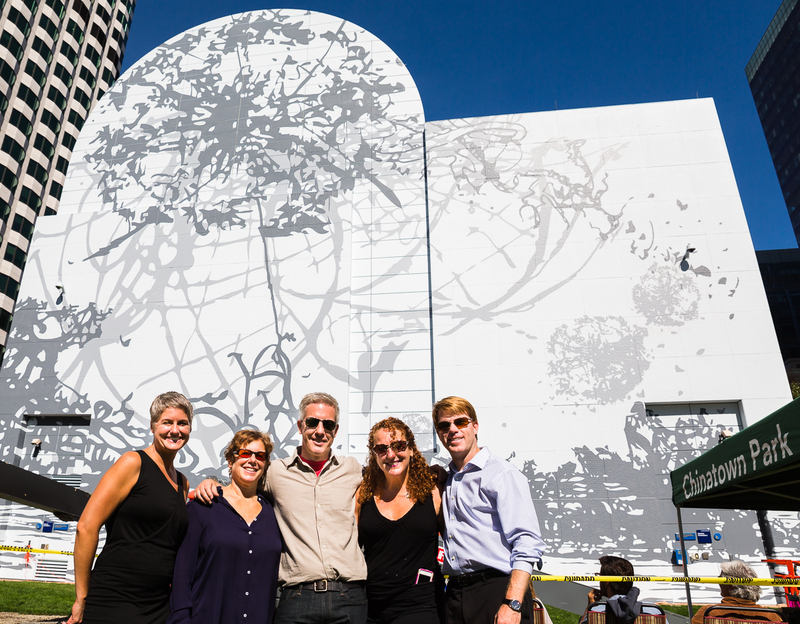 The Greenway mural at Dewey Square was painted by Matthew Richie, Tricia O’Neill, Steve Brettler, Noella Cotnam, Christine Hogman, Loraine Lamb LaLonde and Nelson Licona. Funding included private donations and support from Tricia O’Neill & Signs Unique, Jodi & Hal Hess, Patricia La Valley & Geoff Hargadon and Mark & Marie Schwartz. Benjamin Moore & Co. and NES rentals supported the project with in-kind contributions. Ohhhhhh ……… this is wonderful !!!! I think the mural is a huge improvement from the previous one.